3.) Happy Anniversary, Gram and Papa Dickson! 4.) I have been home from my mission for exactly 2 years. 6.) We move out of our apartment in 5 days. 7.) We begin the flight to Cambodia in 11 days. 8.) We arrive in Cambodia in 12 days. I had better get busy celebrating numbers 1 through 5, and then packing, and then worrying about Carson's survival in Cambodia. Can't promise any posts or pictures anytime soon due to the above list! Oh, and happy finals week! Coincidentally, Reagan and I have very similar posts this week. Maybe it's because we're both moving, and we both like treats!! Rick and I are currently creatively consuming everything in our pantry and food storage (alliteration not intended). The fruit snacks and granola bars were easy and enjoyable to get rid of, but try choking down 3 bags of marshmallows and 2 pounds of powdered sugar. We recently had to bring treats to 2 different events (a mission reunion, and Rick's public speaking class), and the ingredients were successfully used up. The cupcake idea was easy: I had 2 cake mixes and tons of powdered sugar. For the other, I used the famous, wonderful, amazing Allrecipes.com feature of typing in the desired ingredients to get a recipe. I had marshmallows, cocoa, chocolate chips, and Rice Krispies cereal. These chocolatey bars are GOOD. Rick's class devoured them in seconds. I'll put the recipe in as a comment. ...and a random Thank You card I made recently, for the Sullivans. Gotta love those people. They provided us with a wonderful service opportunity and took us to a Jazz game. A certain Elder and Sister Otto are on an airplane right now, returning from their 2-year mission in the Caribbean. 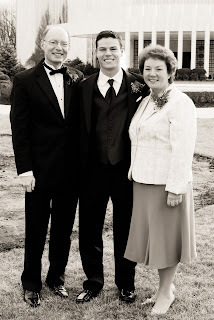 I first met my in-laws at my wedding. (Can you calculate the timing??) Then, with our 6-month-old fetus in tow, we visited them in the D.R. This will be the third encounter for me, and Carson's first outside of the womb. I think an Ode is supposed to be a poem. This is not a poem, but rather an account of last week, the week I met my match and decided that single moms deserve some sort of huge reward, like their very own personal nannies, housekeepers, chauffeurs, and cooks. ...and entertaining himself, especially during the hectic morning routine, which included making everyone breakfast, bathing all 3 at once, dressing them all, loading them into the car, and taking Landon to kindergarten. Unfortunately, it was cold and SNOWY, so playing outside wasn't an option for the first couple of days. Tons of toys and games, like Mousetrap, were brought out to channel the energy. and Ryker always had food or nose products encrusted on his face, no matter how many times I tried to wipe it. So, we survived one toilet that overflowed all the way into the next room, an entire bag of tortilla chips dumped on the floor and consequently stomped on and eaten by everyone, innumerable other spills, including Xander's entire plate of dinner one night, several sleepless nights due to Carson's being way overstimulated, one incident in the bathroom that involved... a huge mess... (I'll spare the details on that one), and a few other adventures. After Rick finally came and helped us get ourselves back in order, I just could not imagine what it would be like to be a single mom. I deeply admire and respect anyone who has had to go through a period of time raising children without a spouse. Almost 3-year-old nephew Xander excitedly approached me the other day exclaiming, "I saw Uncle Ricky on TV!!" I came over to see what he was talking about, and an old episode of Reading Rainbow was on. As the face of Reading Rainbow host LeVar Burton flashed on the screen, he said, "See?! Ricky!!" Xander's discovery of a Rick Otto look-alike isn't nearly as flattering as the more common declaration that he looks like Matt Damon. So, what do you think? LeVar or Matt? Yesterday, April 7th, it SNOWED. Where, oh where, is Spring?? Yesterday morning, Carson and I were headed to Wally World to purchase some large plastic storage bins. (Yes, I dared to enter the less friendly, less organized, poorer quality, and definitely not-as-cute Wal Mart over Target. In a very few instances, Wal Mart trumps Target. Large plastic storage bins for $4.50 each fall under that category.) So, on our way to Wal Mart, we naively assumed the clouds and sprinkles would subside. As we drove, the rain turned to hail, and then SNOW! Like, huge flakes, sticking to the grass, white all around. Parking, entering the store, and returning home were more adventurous than planned. So, what do we do on a snowy day in April? Dream of springlike weather, and take pictures of Carson, of course! Here are the results of his photo shoot in the snow suit. And then, we played Pat-a-Cake. A beautiful baptismal service took place in a river, as a celebration of the 200 year anniversary of Joseph Smith's birth. My good friend, Mara Priscila Ariza Funes, was baptized that day. Here she is with Marco Reyes, who baptized her, me, and my wonderful companion Herman Killian. Fast forward almost exactly one year. A beautiful wedding ceremony took place. I got married in this dress. Meanwhile, Mara and I kept in touch and continued to be friends. I got my dress out to try it on one last time before packing it up, and to take a picture of it. (I felt quite silly prancing around the apartment in my wedding dress, trying to set up the camera for my very own photo shoot. So this is what stay-at-home moms do!) I then took it to a friend who would be traveling to Chile. Soon, Mara will receive the dress! Her faith, repentance, and baptism have led her to the point where she is ready to be married in the temple. I am honored to have her wear my dress. My cell phone was pronounced missing on Saturday, March 29th at approximately 11:00 p.m. It was last seen at the Clark Planetarium in Salt Lake 3.5 hours previous to the discovery of its disappearance. After 6 days of intense searching of the Otto car, apartment, and even the Clark Planetarium itself, the phone has now been pronounced dead. 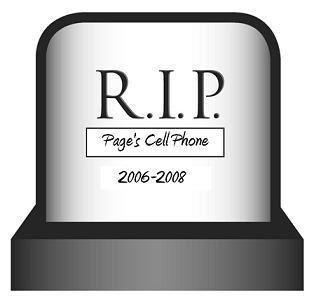 The cell phone began its life in a T-mobile store in Ashburn, Virginia in December of 2006, after its predecessor randomly stopped working. It was only 10 dollars, which made me very happy. It has served me well these past 16 months, and I am struggling to accept the loss. What's even WORSE is the loss of ALL the phone numbers in there, the loss of my OWN phone number, and the loss of several text messages that have great sentimental value, including the very first text exchange that took place between Rick and me. The first text from Rick to me was, "Thanks for the huevos rancheros," dated July 4, 2006, referencing the eggy breakfast casserole I had made to accompany our first "date," where we did a Physics 106 practice test together over a romantic breakfast. We've only been doing it for a couple of days, but it feels wonderful! Scripture study is done first thing. Rick is home for close to 3 hours in the morning, so he can be here with Carson while I leave to do laundry, rent a vacuum, grab bananas from the Creamery, etc. Yesterday I had the laundry finished and kitchen clean before 7:30!! Amazing!! This also creates more time for things like blogging, exercise, and hobbies. (That's right, two posts today!) And, of course, more time to dote on Carson and take pictures and videos which are probably redundant and boring to everyone except grandparents. The purpose of this post is actually to share the abundance of Carson's photographical memoirs. Newly obtained grasping skills. 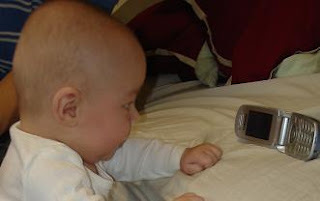 Why do all babies love cell phones? He still hates tummy time, although we're forcing it on him. This kid LOVES to stand. Here he's saying, "Let go, mom, I can do it!" Rick has been wanting to put shoes on him for some time. Impractical, but cute! Big smiles and giggles are becoming more and more frequent. Not sure why Carson is sans clothing here. He's eating his hands, as usual. Rather than purchase more size 2 diapers, we've decided to use up the size 3 and 4 diapers given to us by family before we move. He seems ok with it! Video number one illustrates the reason for the Bumbo Chair recall. He hasn't fallen out, but he seems pretty close! And video number two illustrates a unique bedtime story. We are becoming experts in Salt Lake City site-seeing. Our visit last weekend with Rick's lifelong friend, John, was our second SLC trip in the past month. Despite it being a bit chilly and extremely windy (see family picture above... I have not gained 50 pounds nor gotten a crazy hair d0; it's the wind, I promise), we had a wonderful time. 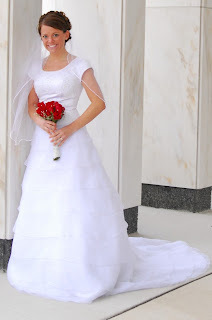 I did feel deep sympathy for all the brides walking around the temple to take pictures. There was no taming hair nor dresses with all that wind. We used the Connect Pass again for admission to Thanksgiving Point, the Clark Planetarium, an IMAX movie (the Human Body! Yeah! ), and lunch at the Lion House. This time, we threw in the official tour of Temple Square. I could have spent the entire afternoon in the Visitors' Center there with all the interesting exhibits on the scriptures, interactive videos, beautiful paintings of Christ's life, etc. We also spent more time in the dinosaur museum and were especially impressed with the Supersaurus, a genus of diplodocid sauropod dinosaur discovered in the Upper Jurassic Morrison Formation of Colorado in 1972. (I'll let you decide if I just learned a lot at the museum or used Wikipedia for that one.) The Supersaurus is H-U-G-E. I couldn't believe it. In the first pic, I am standing by his leg, and I don't even come up to his knee. In the second, I am the tiny figure by his hind side. John and Rick pondered whether or not they could have beaten up the Supersaurus. They decided in the affirmative, which boosted their manly morale. In Salt Lake, we also attended mass at the Cathedral of the Madeleine, which was beautiful. John, a potential Catholic priest, showed us the ropes of the mass, and we appreciated learning about their methods of worship. Since the visit, Carson has been doing a lot of soul-searching. We loved having John come visit! Come again!